56 to 1 in 2018? Investors shouldn’t expect the Philippine peso’s year-end rally versus the U.S. dollar to continue into next year. The current Philippine Peso to U.S. Dollar exchange rate, as high as 51 to 1 earlier this year, now stands at around 50 to 1. The currency will again slide to 51 per dollar by the end of 2018, a loss of about 1.5 percent from current levels, according to the median estimate of a Bloomberg survey. Most bearish 2018 estimate calls for the Philippine Peso to hit 56 per U.S. Dollar with the median at 51. 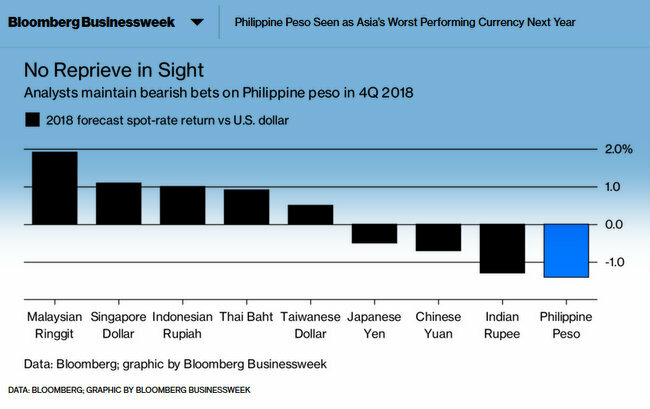 “The peso is likely to once again underperform the broader Asia block,” said Lin Jing Leong, a Singapore-based investment manager for Asia fixed income at Aberdeen Standard Investments. Despite the good news regarding the exchange rate, the bottom line is this: are we keeping up with inflation? First, let’s take a look at the historical inflation rate of the Philippines from 1998 through November 2017. We retired to the Philippines in July 2009. At that time the Philippine Peso exchange rate was 48.05 pesos to 1 U.S. Dollar. However, we’re not keeping up with inflation, even if the exchange rate reaches 56 to 1 in 2018. Why? By my estimates, the inflation rate has gone up 29.3% since 2009 when we moved to the Philippines. Our exchange rate hasn’t kept pace. For example, say we received 72,000 pesos at 48 to 1 exchanging 1,500 U.S. Dollars back in July 2009. At today’s exchange rate, 50 to 1, that $1,500 would net us 75,000 pesos. That’s 3,000 more pesos than 2009 which is a 4.1 percent increase. However, if the rate does go to 56 to 1 in 2018, that $1,500 is now worth 84,000 pesos. That’s a whopping 16.6 percent increase from the 2009 rate. The Philippines’ annual inflation slowed down to 3.3 percent in November 2017. In the previous month, inflation was pegged at 3.5 percent and in November 2016, 2.5 percent. A slower annual increase of 3.2 percent was noted in the heavily-weighted food and non-alcoholic beverages index. Lower annual mark-ups were also recorded in the indices of alcoholic beverages and tobacco at 6.1 percent; clothing and footwear, 1.8 percent; and education, 2.2 percent. Our housing costs remain the same. We own our own home free and clear and have no mortgage payments. Our water costs were much lower in 2017 as we have had plentiful rains throughout the year. We only needed to have one water truck delivery in May at a cost of 2,500 pesos, $50.00. We have been benefiting from a La Niña system. Last year, however, we experienced severe drought conditions due to El Niño and required multiple water truck deliveries beginning in February. We have two wells and a home purifying system for our drinking water. Our total electric bill for 2017 was 56,600 pesos, 1,132 U.S. Dollars, an average of 4,716 pesos a month, 94 U.S. Dollars. We only ran our air con a few times in April and May but the pump for our pool adds about 1,000 pesos to our monthly bill, 20 U.S. Dollars. Our total electric costs in 2016 amounted to 50, 385 pesos, 1,000 U.S. Dollars, an average of almost 4,200 pesos a month, 84 U.S. Dollars. However, we did not have our pool completed until August 2016. Diesel fuel for our Ford Ranger has gone up considerably this year. We are now paying around 37 pesos a liter, about 10 pesos more per liter from the beginning of the year. The new Tax Reform Bill that recently passed in the Philippines will add at least another 3 peso tax per liter. 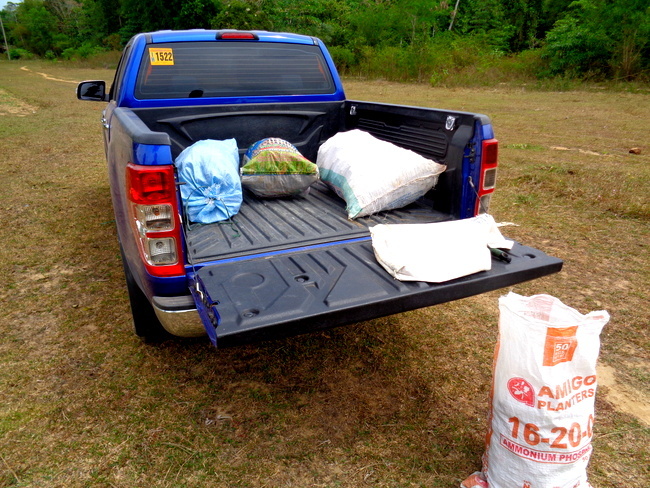 However, our truck is very fuel-efficient and we only need to fill our tank about once a month at a cost of around 1,000 to 1,200 pesos a month. Excluding selected food and energy items, core inflation however, moved up faster at 3.3 percent in November 2017. In the previous month, it was registered at 3.2 percent and in November 2016, 2.4 percent. The country’s annual increase of the food alone index slowed down to 3.3 percent in November 2017. Its annual rate in the previous month was recorded at 3.8 percent and in November 2016, 3.5 percent. The index of sugar, jam, honey, chocolate and confectionery further declined by 3.2 percent. Similarly, the annual rate of the vegetables index dropped by 1.3 percent. In addition, slower pace of increments were seen in the indices of rice at 1.0 percent; oils and fats, 5.7 percent; and fruits, 3.6 percent. The rest of the food groups had higher annual increases or retained their previous month’s rates.